Sky has announced that it is merging Sky Player and Sky Mobile TV into a new offering, called Sky Go. The mobile service is free to all Sky customers and features all the functionality of Sky Mobile TV and Sky Player but you will not be able to access dome channels – it all depends on the device you are using. 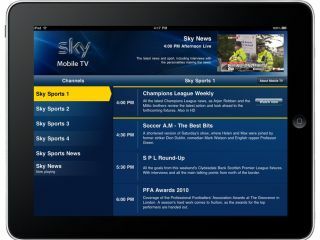 If, say, you are using an iPad, iPhone and iPod touch then you will get access to sports and news content only - Sky Sports 1-4, Sky Sports News and ESPN. Originally this was given away for free as part of a trial last year. If you are watching from a laptop, PC or Mac then you have access to 30 live sports, movies and entertainment channels and various VoD ones too. If you fancy getting all this access but don't have a Sky account, then you can pay from £15 a month for the privilege. Xbox and Fetch TV customers will get the same service they have at the moment, but it is to be simply rebranded to Sky. "The explosion of smartphones and tablets demonstrates the increasing consumer demand for accessing entertainment and communicating on the move," said Stephen van Rooyen, Deputy MD of Sky's Customer Group. We have already responded to this by offering a range of services, including live TV, across many new innovative platforms and devices, like laptops and iPhones. "Clearly the consumer appetite is there, and it's growing. In responding to that, and to create even more value, choice and flexibility for our customers, we are now going to offer online and mobile access to Sky content at no extra charge." Sky has also announced that Sky Go will be supported by The Cloud – the outdoor Wi-Fi network. Timings for the rollout of The Cloud are still to be announced. The Sky Go UK release date is 6 July.